Observing alert for Mercury and Mars. 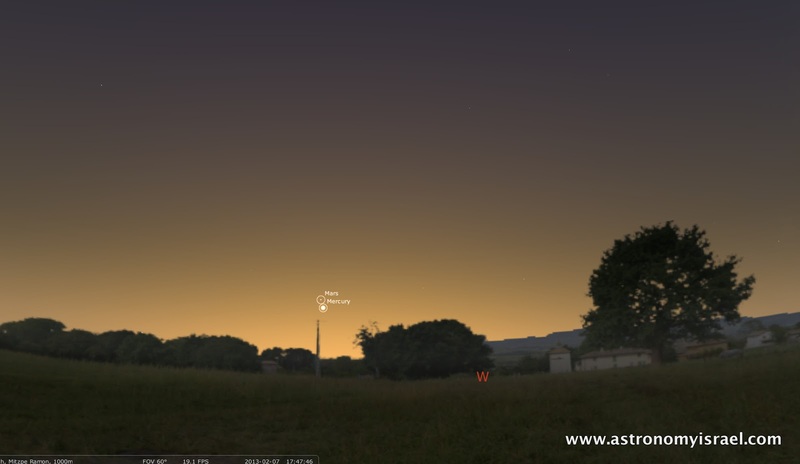 These two planets will appear within one degree (twice the diameter of a full moon) of each other just after sunset on the Thursday evening of February 7, 2013. You will need a very clear horizon to the south west, and possibly binoculars, to see them both this close to sunset. Mars will continue to disappear into the sun, but Mercury will continue rising into the evening sky for its first sunset apparition of the new year. Keep an eye out for it as February advances. Mercury and Mars appear just south of west in the early evening sky on Thursday, February 7. This view is for 5:45PM on the night of February 7, but the two planets will continue to be close to each other for the next couple of days. Watch Mercury and Mars Appear in the Night Sky: Don't Miss Out!